View More In Puzzle Accessories. With small parts,please take care when your under 3 years old kids play with it. Double side magnetic: Not like other wooden drawing boards are just one side with magnetic, Play this drawing board,children can draw with marker pen and play jigsaw puzzles on both sides. Combine Puzzles with Paintings: 71 pieces magnetic puzzles to open your imagination and drawing kids' thought. Adjustable and removable board: The wooden box is designed with a removable board lid which can stand up in the box,which is more convenient for kids' drawing and playing. 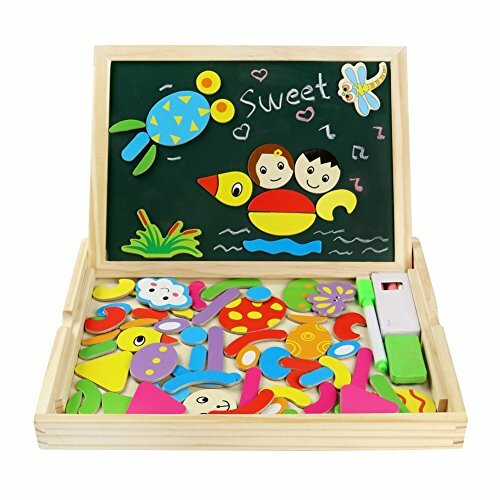 Easy to carry and store with wooden box: Kids can store the wooden puzzles in box by themselves after playing and it is convenient to keep your child have fun anywhere. Warning: CHOKING HAZARD---Not suitable for children under 3 years. Please keep your kids play under adult supervision.High quality and safe for children. If you have any questions about this product by Fajiabao, contact us by completing and submitting the form below. If you are looking for a specif part number, please include it with your message.